Happy Birthday, dear Star Wars | What Hi-Fi? What Hi-Fi? 's senior video editor Pete Brown dwells on the cultural and personal impact of Star Wars - which was released on this day in 1977. 1977 was a milestone year: Apple sold its first consumer product (the 8-bit Apple II); What Hi-Fi? turned one year old; I was born; a tiny, insignificant space fantasy called Star Wars was released in cinemas. As far as 40th birthdays and anniversaries go, 2017 has quite a few. I think it’s fair to say Star Wars has influenced a few people along the way. A lot, in fact. Without it we wouldn't even have the modern summer blockbuster. Alien, Star Trek: The Motion Picture, and TV's Battlestar Galactica were only green-lit because of the mammoth success of George Lucas's space opera. The big names working on blockbuster films and Netflix shows today cite Star Wars (retitled Episode IV: A New Hope in 1981 once more sequels got made) as influential – from JJ Abrams to Simon Pegg to Peter Jackson. And there's a whole new generation falling in love with the films thanks to 2015's Episode VII: The Force Awakens. But what of its influence on me at a personal level? Star Wars may just be the reason I've done anything at all. Not consciously, of course, but I can't help but think where my career has taken me. I've studied film production, dabbled in digital special effects and old-school model making (did you know that Luke’s lightsaber was made from a 1940s Graflex camera flashgun? ), and have even been involved in a few short films as DoP and editor. I've toured with orchestras across Europe, and followed up my music degree with two Masters composition degrees - one of which focused on Film & TV composition. And all because of a whiny farmboy who saves a princess. Specific scenes and images have stuck with me through the years. The long opening shot of the Tantive IV being chased by an Imperial Star Destroyer is still one of the strongest introductions to a film I can think of: the Rebel blockade runner looks huge as it flies over the camera, but it’s quickly overshadowed by a much bigger ship. And that ship seems to go on forever! With the laser fire and the giant menacing juggernaut, you get a sense of who the underdogs are, and how high the stakes have already become. And that’s before any dialogue is even spoken. The Cantina scene is another great set piece. It’s not just a fun scene with catchy music. It introduces us to Han Solo and Chewbacca, sets up the story’s trajectory and firmly cements the film in the wider universe of aliens, space creatures and, as it turns out, a whole load of monsters from the studio archives. Yes, that is a wolfman in the bar. My favourite scene of all, though, is the Death Star trench attack. One by one, the rebels lose their best X-Wing pilots to trench lasers, TIE Fighter blasts and, in Porkins’ case, just slow reflexes. It feels like they might not actually reach their goal. Then, from nowhere, Obi-Wan’s ghostly voice gives Luke the most important lesson of all: ‘let go, trust your instincts and use the Force’. I dare anyone watching this scene not to feel something spiritual stir inside them. The rest of the story was nothing new, though. A medieval fairy tale told in space: the farm boy who rescues a princess, battles the dark knight and saves the kingdom from oppression by an evil ruler. Not new at all, but it’s an arc that still resonates with audiences 40 years on. There's also a lot of homage/pastiche/rip-offery. 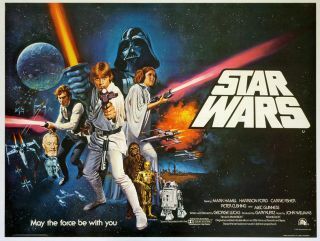 Star Wars was a love letter to the Golden Age of cinema, and has lots of nods to that era. It’s told from the point of view of C-3PO and R2-D2, the two droid servants - a storytelling device borrowed from earlier masterworks, most notably Akira Kurosawa's The Hidden Fortress. John Williams's classic score isn't entirely original, either. It's a masterpiece of film scoring, but borrows heavily from Stravinsky and Holst, as well as legendary Hollywood composer Erich Korngold. Did this detract from audiences enjoying the film? Not a bit. Perhaps the amalgamation of space fantasy (it’s not sci-fi, even Guillermo del Toro agrees with me) and a recognisable 'hero's journey' tale, held together with familiar music, was all that was needed to cement the film into the social consciousness of the entire world. I still enjoy watching old footage of audio editor Ben Burtt creating the iconic sounds of lightsabers, TIE fighters and the myriad alien sounds of the original films. It's an amazing insight into what can be achieved with some imagination and some knackered old hi-fi kit. So as Star Wars and I turn 40 this year we can both look back at our successes and failures (we've all got prequels we're ashamed of, right?) and look forward to new projects and challenges. There's yet another film out this Christmas (the eighth in the franchise), along with a Han Solo spin-off movie in the works. My kids already love the films as much as I did at their age, and maybe they'll be influenced by Star Wars, too. MORE: Are these the Star Wars gifts you're looking for?